As you can see from the compressed nature of the collage above, a fella was present at a fantastic evening in Lavinia this week. A dinner with the great Eduardo Ojeda of Grupo Estevez (including Valdespino and La Guita) and, of course, Equipo Navazos. And my kind of dinner too: six courses with a mere 13 wines and a brandy. It was a top evening in every respect, with first class wines, excellent knowledge from the horse’s mouth, good food, and charming company. The tasting was also cleverly structured. 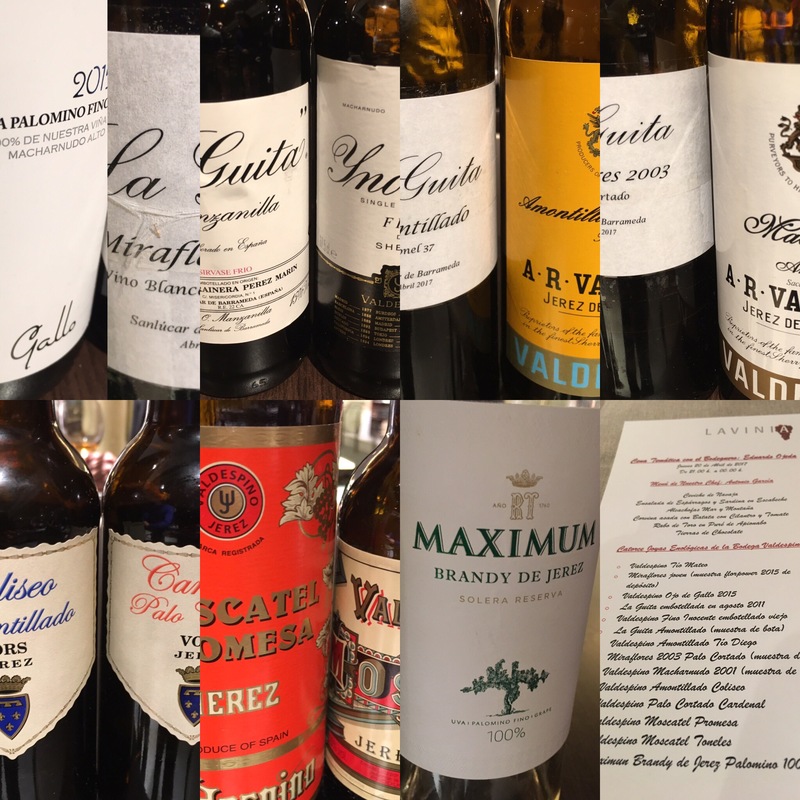 After a nice refreshing glass of Tio Mateo as an aperitif, and as the collage above shows (if you look closely), with each course we had wines from both sides of el marco – La Guita/Miraflores (Sanlucar) and Valdespino/Macharnudo (Jerez), respectively – and with increasing age/intensity. Round 1: Miraflores Joven (a sample of the Florpower 2015) and Valdespino Ojo de Gallo 2015. Two young unfortified palominos from these two famous pagos and I found the comparison very interesting. The Ojo de Gallo was recognizably macharnudo and had that breadth and flavour but the Miraflores, while of course not a finished wine, had not only a fresher profile but what seemed like more punch on the nose and palate. Very curious contrast between the two and really set the scene for the wines to follow. Round 2: La Guita (bottled in 2011) and Fino Inocente, also with time in the bottle. These are both classic, fortified and solera aged wines and, as you would expect, they were noticeably finer than the wines that had gone before. Actually the second time I had tried this 2011 bottling of La Guita and with a couple of years extra time in the bottle it seemed to have not only evolved but also improved, with a lot more hazelnut nuttiness than you might normally expect. The Inocente was fantastic – just like the first wine it seemed quiet and restrained at first but soon opened up and showed its class, with hay bales/esparto grass on the nose and that big, yeasty/bready/nutty palate. Not as evolved as the La Guita and I honestly couldn’t have told you that it had spent time in the bottle had it not said so on the menu. Round 3: La Guita Amontillado (bota sample) and Amontillado Tio Diego. Two really class wines with the next course: amontillados from Sanlucar and Jerez respectively. Again a fascinating contrast, the Sanlucar wine offering up crunchy bar on the nose and hazelnut and roast apple sauce flavours on the palate while the Tio Diego had more caramel and dairy notes, again big hay bales and punchier fruit, more like marmalade than apple sauce. I had kept a glass of Inocente alive and it was fascinating to hear that the Tio Diego and Inocente came from soleras in parallel and with the same number of criaderas – the principal difference being not the total age but the speed of rotation down the solera (one saca and rocio per year rather than two). Round 4: Miraflores Palo Cortado 2003 and Valdespino Macharnudo 2001. Two single vintage wines that are very sadly not commercially available. The Miraflores Palo Cortado might have been the wine of the night and had a bit of everything, a beautiful rich amber colour, a nutty sweetness on the nose and a beautifully elegant toffee, nut and mineral palate. As is now de rigeur there was some discussion as to why it was a palo cortado and Eduardo’s explanation was simple: it smells and tastes like one (some subtleties may have been lost in the summary). By its side the Macharnudo 2001 maybe didn’t sparkle quite as brightly but was a delicious wine in its own right. More serious, with less sweetness and more haybales on the nose and a deeper nutty and zingy palate, but still elegant and balanced. What really struck me about these two wines, however, was the contrast in profile – the vertical, fresh feel to the Sanlucar wine compared to its horizontal, fuller Jerez counterpart – a difference that seemed as clear as it had with the first two wines. Round 5: Amontillado Coliseo and Palo Cortado Cardenal. Now these two wines are both Valdespino but even so we maintain the distinction between Sanlucar and Jerez: the Coliseo is an outrageously old amontillado refreshed only with manzanilla while the Cardenal is of course refreshed with fino. They were both absolutely epic and worthy of a tasting to themselves. The Coliseo is like a highly polished wooden javelin: dark mahogany in colour, a punchy, furniture-polish nose and then incredibly saline and dry on the palate with woody flavours of black treacle, burnt cake and pipe tobacco. The Cardenal, by comparison, is a massive war axe, with a salty, iodine and burnt caramel nose and just an enormous palate of treacle and roasted nuts, incisive zingy salinity and sharp acidity. Round 6: Moscatel Promesa and Moscatel Toneles. I must admit that by this stage of the dinner, with any spitting discipline a distant memory, my critical faculties were not everything they might have been and, as I have had occasion to mention before, the sweeter wines are not absolutely my satchel. Nevertheless, although the notes may be pretty patchy the mental fog isn’t thick enough to obscure the fact that these were two cracking wines. The Promesa I hadn’t tried before and was very good – nice light, marmalade nose and a decent edge to the palate – and what can you say about Toneles? Finally out came the brandy to finish me off altogether: the Maximum Brandy de Jerez Palomino 100% 2014. A pretty interesting one too, incorporating a blend of styles and finishes, date specific and 100% palomino (as you may have guessed). A punchy, high quality end to an excellent tasting and evening that was as educational as it was enjoyable.